Hatters at Hilton Chambers i Manchester, England: Reservér nu! **For groups of 7 people or more, we require one full payment 7 days prior to arrival. This will be charged to the card used to make the booking or through alternative card made by the guest prior to this period. **Cancellations or amendments for groups of 7 people or more must be made 7 days prior to arrival by email or the full booking value will be charged. A code of conduct form is to be completed and signed by the group leader, either in advance or upon arrival. A refundable security deposit of £200.00 per group is also required if Stag / Hen groups (cash or credit card details), payable on arrival. FREE Wi-Fi in all rooms and communal areas and pub crawls on Friday and Saturdays! 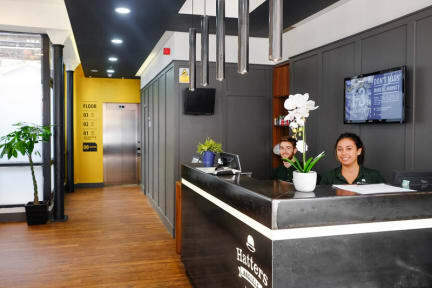 Hatters at Hilton Chambers is a modern hostel offering 3-star accommodation in the heart of the popular and bohemian Northern Quarter of Manchester’s City Centre. Hatters staff are fun, friendly and willing to help you plan your itinerary and offer suggestions for what do during your stay in Manchester. Hatters Hilton Chambers has an onsite deli diner and restaurant called Corner Boy open from 11:30am to 11:00pm - offering the best in brunches, burgers and everything in between! Guests of Hatters receive 15% discount on food and drink. Hatters staff are fun, friendly and would love to help you suggest tours in the city such as the Manchester United and Manchester City Stadium Tours. Hang out in our Holdfast bar in the basement of our other Manchester hostel (2 mins walk away) and share your stories with the Hatters staff, meet the locals and find out all the great places and hidden gems that you need to visit during your stay in this great city! 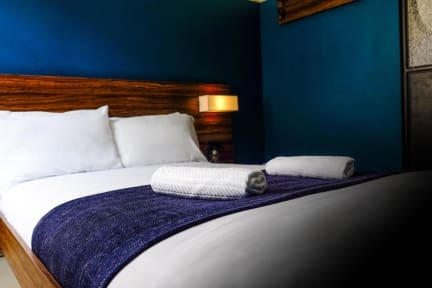 -5 minutes walk from Manchester Piccadilly Station. Please bring photo ID with you - you need it to check in! Drivers license, passport or valid student id. Groups of 7 people or more will be contacted prior to arrival and are required to pay the full balance of their booking and provide a security deposit. A completed Code of Conduct form is required for check in.